There is a new feature at GEDmatch.com – you can look at the GEDCOM of a DNA match easily again. Take the kit number of interest and plug it into the user lookup form. On the next page, with the information about that kit, it will either say NO GEDCOM UPLOADED or there will be a GEDCOM id number. That id number is now clickable and will take you to the person associated with this kit number in the GEDCOM. If you have not uploaded a GEDCOM to GEDmatch.com then I highly recommend that you do so. 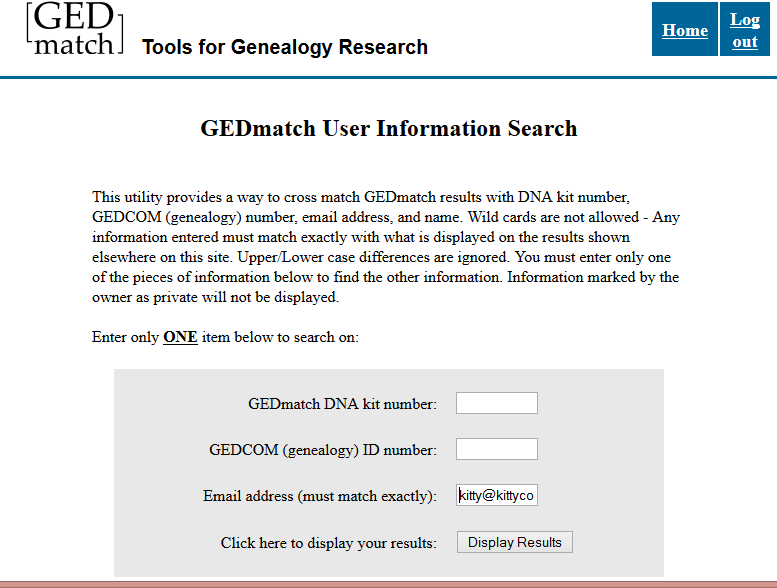 It is helpful to be able to compare your GEDCOM to that of a DNA match. I prefer just 10-12 generations of my ancestors (privatized) as my full family file is way too large. My theory being that is enough generations for DNA matching and I only want ancestors for my DNA matches to look through. I have used red arrows on the above sample excerpt from a GEDmatch home page to show where to upload your GEDCOM file and where to click to do a user lookup. One of my Dad’s top matches is a Norwegian named Frode. I took a copy of his kit number from the one to many matches page. Then on my home page in the second box on the left I clicked on User Lookup and filled his kit number into that box on the lookup form. Note that you can also look for a person up by email address but only use one of the lookup options on the form. 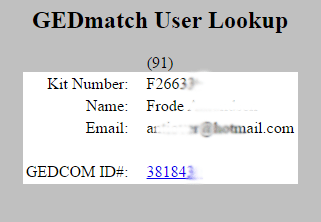 Frode’s user page has a linked GEDCOM id number (image was at the top of this post) so I clicked on that and saw this individual page which is marked private since he is living. Notice the menu at the top of the page. The item most interesting to me at the moment is pedigree since it will show Frode’s ancestors, so I clicked on that. 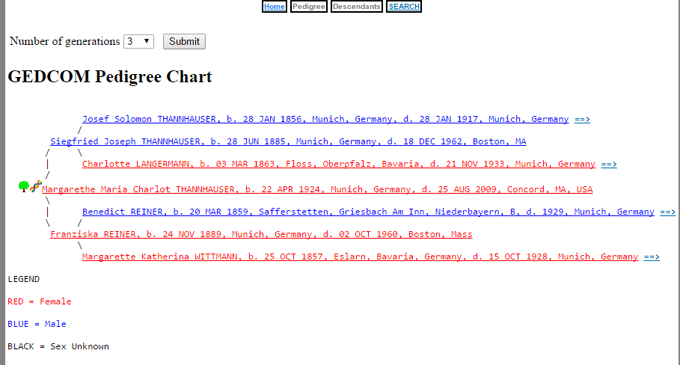 The pedigree page can be adjusted to any number of generations. Here is my mother’s pedigree as an example, adjusted down to 3 generations. I quickly gave up on looking through Frode’s detailed pedigree and decided to use the one-to-one GEDCOM compare at GEDmatch to find our common ancestors. You get to that utility by clicking the 2 GEDCOMs under Genealogy in the middle right hand Analyze your data box. 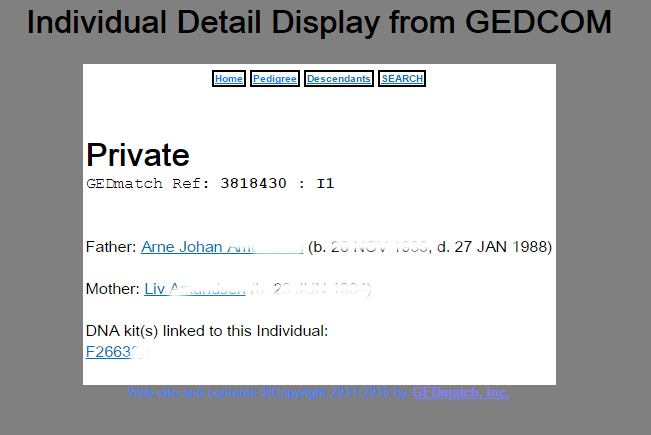 You need each GEDCOM number; your own GEDCOMs are listed at the bottom left of the home screen under Your GEDCOM Resources and I found Frode’s on his user profile (as described above). Warning there are some misleading messages at the beginning of the output from this function that might make you think you are comparing to all GEDCOMs. You are not! So I clicked the confirm buttons for each good match. Later when I clicked the blue left to right pedigree symbol to show yet another common ancestor’s descendants I noticed little trees in the list which indicated where people listed are linked to another GEDCOM (to mine of course). You can also choose to compare your GEDCOM to all the GEDCOMs in the database as well by clicking the 1 GEDCOM to all instead of the 2 GEDCOMs function. A long time ago there was a linked G in the one-to-many DNA display which clicked into your match’s GEDCOM. That proved to use too many resources so it was removed. I found that I missed that capability so I suggested that they link the GEDCOM id in the user profile and I am very grateful that they did. I asked for it, I got it, thank you GEDmatch! A facebook reader pointed out that, for those of us with multiple family members whose kits are on GEDmatch, it is easy and useful to link their kit to their entry in your tree at GEDmatch. Do this by clicking your family member’s name on any display page reached via the lookup suggested above or the GEDCOM comparisons. 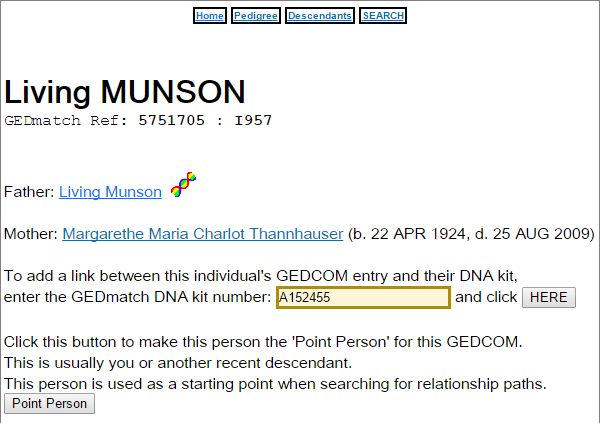 This gets you to their individual page and at the bottom of that page there is a box for inputting the DNA kit id at GEDmatch. For example, I just added my brother’s ancestry kit by typing it into this form and clicking the Here button. ← Ancestry.com DNA Day 2015 sale has arrived! 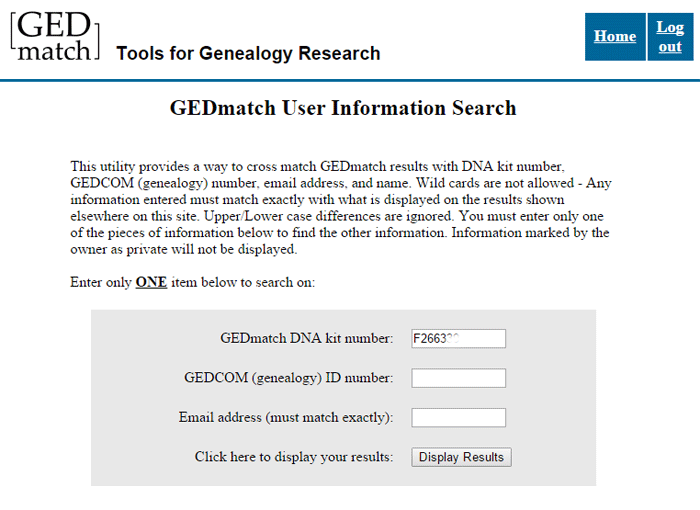 i miss the Gedcom + DNA matches function at Gedmatch. I has been down for months. It automatically matched our matches in fewer steps, but, thanks for these instructions. Do you know anything about DNAgedcom and how does it compare to Gedmatch? Would you upload data to both? How do you create the abbreviated GEDCOM that you upload? I use RootsMagic for my PC and have a similar tree on Ancestry. Can you split a gedcom from ancestry.com? Sharon – You can export a GEDCOM from an ancestry tree you manage but you cannot select individuals to export, only the whole tree. You need to use genealogy software to split it. There are many free and paid varieties out there. Thanks! Does gedmatch automatically mark living (those with no death date listed) as private or does that have to be done somehow before creating the gedcom? yes you can. Look at the options for exporting in Roots magic…at the upper left you can choose only select individuals, then in the search box enter your name and click the box to the left and select ancestors only option. It will mark them and you can continue with the export and chose the privatize options on the right. Thanks – I found GED2GO and its seems to work well. I am new to Gedmatch. I want to download my tree from Ancestry but I do not understand how to get the living people from showing up. I see from previous posts that I need to get software in order to make the necessary changes. Is there any software I can download for free (that are safe to use)? Right Cheryl, download your tree as a GEDCOM then use a software program to privatize it. I use family tree maker which is not free. But there are others, MyHeritage has a free program among others. Legacy has a free program. This program prepares a GEDCOM file for public distribution. It removes all living persons and adds an estimated birth date to every person that lacks one. Click the ? button and then click here for details. My question: I am living and my aunt is living. We took the DNA test. If this program removes all living people, what is the point in uploading to GEDmatch? I couldn’t find the answer to my question on Gedmatch or just googling, though your blog came up here. I was noticing as I was looking at some Gedcoms on Gedmatch today that you can search all the gedcoms. I have a name change / rare surname that I’m working on for my husband. I actually can find a rare surname that I had looked at twice for a name change that is known to have occurred back in 1700s NY, but the original name is not known. He has a segment match with someone on FTDNA that has the rare name, but it’s the only one I can find on FTDNA or 23andMe. I turned up a bunch of Gedcom listings of the rare surname being in the right place at the right time on Gedmatch, but it lists just Gedcom i.d.s and email addresses. The only way I can think of to see if husband matches any of these is to call up his list and try “find” on each email address. Is there a better way? Hi Kitty..how do you make the living private..I would like to upload mine. When I use the search option by name on this…..
Are all of the results on this specific persons DNA tree? Or does it pull from the entire gedmatch database? Can a change be made to a pedigree, once the file has been imported to gedmatch? Help. I was uploading my GEDcom and it only partially uploaded. What page on GEDMatch do you delete your uploaded file? I have heard about a red X somewhere but can’t seem to find it. I seem to have found it. Thanks anyway!! How long does it take to upload a GEDCOM file. I’ve tried to upload several times and have waited for hours to do so. Do you get a signal that the upload is complete? How large is your GEDcom? In the countless hours that I’ve spent on GEDmatch.com, a large part of the time has been spent manually filtering out all the results who are NOT blood relatives of people in their gedcom. This process is incredibly frustrating for me (wasted time). 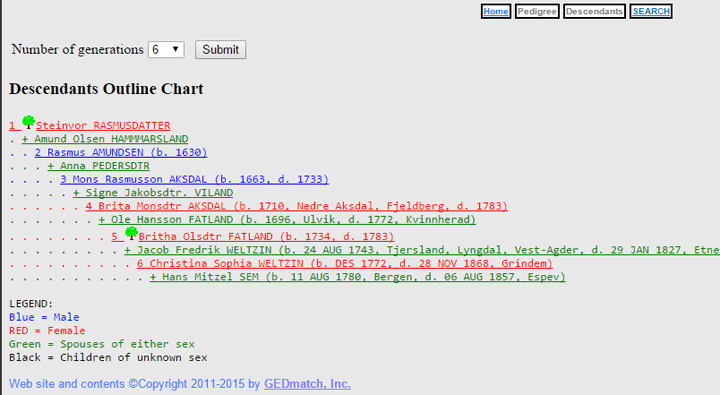 Are you aware of a simple gedcom editor that would trim a gedcom, to make it applicable for upload to DNA genealogists? I would like to recommend an app like this to users… (and I would like it if GEDmatch would recommend it to those uploading gedcoms). Tim, most desktop genealogy programs have the ability to expert a gedcom that is just the ancestors of a specific person. At least family tree maker has that option. I uploaded my kit from 23andme. I also manage my father’s kit on 23andme. Now that I have uploaded my kit, I do not see instructions on uploading my father’s kit. Could you instruct me on how to do that? Thank you. I just loaded my autosomal DNA and gedcom tree from Ancestry.com. So I am very new to the site. As I was going through my gedcom matches I mistakenly confirmed a few matches that are not truly matches. How can I “unmatch” them? I have googled and searched the FAQs but see nothing that answers my question. Would appreciate any help and thank you for your blog! There is no way to undo these! So I contacted an admin and got all your matches undone. If you make a mistake again just send an email to GEDmatch at gmail and explain what you need corrected. Matches you have made are marked by a little green tree icon in your tree. You can view your tree by clicking on its id number in the GEDcom box on the bottom left of your home page then clicking pedigree at the top. You can increase the number of generations also. how do i get a gedcom i have DNA done by ancestry and a family tree im confused and i just uploaded to gedmatch any help please? If I close the list of common ancestors that GEDmatch generated using my uploaded GEDCOM, will the entire search be lost? Last night I created a GEDCOM from my Ancestry.com family tree and uploaded it to GEDmatch. This morning it shows me the results of the “Search for possible common ancestors,” but when I click on any of the link icons, it always says that it is not connected to the server, so the link does not work. I tried logging into GEDmatch using a different browser so that I could leave the list of common ancestors open, but I could not find a way to look at the list of common ancestors on GEDmatch by that method. I am leaving the list of common ancestors open until I find out whether I can close it without losing the entire search and having to start all over again. Kindly advise me what to do. Thank you. Yes your search will be lost if you close that window. Cut and paste its contents to a word doc to preserve the links. Control T will open a new tab in most browsers. Use that tab to log into gedmatch again and then your links from the original window should work. Uploading my DNA to gedmatch sounds fine, but I;m coming from a Mac, and it doesn’t upload..and their “help” comment telling me how to workaround the problem doesn’t work because the way they tell me to do it does’t work because their guide to how to do it is wrong…and then there’s the problem I have no way to communicate with them to tell them their help doesn’t work. What’s a guy to do? Loaded my Ancestry raw data files yesterday. Got my kit number and I am sure I saw activity in the Gedcom Resources but today nothing. Message under resources is “There are no GEDCOMs associated with your log-in email address.” Is there a problem or am I just too early. If you uploaded your ancestry DNA file that is not a GEDcom. A GEDcom is a separate file that has your family tree information not your DNA. ok I’m confused…I did exactly as instructed . I downloaded my Ancestry test results file from ancestry and uploaded to the GedMatch website. I probably mis-spoke by calling it a Gedcom file. Hi, are you still there? I need help. I just uploaded my GEDcom from Ancestry to Gedmatch and I need to take it down. Everyone is showing. Is there a way to disconnect it? Kitty, I am not finding a method to delete my gedcom. I do go to ‘My Gedcom Resources’ and find my gedcom info line, but clicking on it does not bring up a panel to delete. I also tried right click. How can I do what this error message tells me to do, ie unlink the kit owner’s name from another individual in a that kit owner’s Gedcom. (197) ERROR: Kit T032269 is already linked to a different individual (William Walrond of Isle ) in this GEDCOM. Each kit should only be linked to the single person represented by that kit. You must delete the other link first, if you need to change it. This was forwarded to the support team at gedmatch whose email is gedmatch at gmail. OOPS – I did not scroll down far enough. I thought it was a red X on another panel somewhere. I have now clicked on the red X, and the ‘are you sure’ panel, the system has done the delete. New at using the Gedcom search tool. Entering a surname and locale for kits I manage produces a genetic symbol (assuming that indicates how many gens back we link, but sometimes an X in a box. Assumed that indicated an xdna match (ie kit mother). Confusion is three kits for my surname while they all link to my GGGG Gr born 1741, then branch in three separate lines to tested individuals with obviously different mothers generate that x symbol? Kitty to clarify, each kit has been entered with a different email (hopefully this allows me to check the GEdcom surname ID against each individual?). I’m positive I am entering the correct kit number. All your DNA kits are listed in the left hand column so you can double check it there. When you click on your gedcom file you have a box where you can add this kit number to that person in the tree. If you are still getting an error please contact gedmatch at gmail with the full details. MsKitty, I have made many changes to my family tree/ GEDCOM. I know how to delete the old one from GEDMatch and upload a new one, but what do I risk with the change? The GEDCOM # changes — is that an issue? What might I lose? Matches, other information? Thanks for any information. I prefer to put kit numbers in my family profiles (with their permission of course) at WIKItree so that the link to my more accurate and up-to-date tree there appears in the one to many for my DNA cousins. I tried to link my brothers kit number to the GEDCOM of our family and it gave me a blank screen. Could this be because he is in Genesis Beta (23and me DNA source)? Cannot link to DNA kit managed by somebody else. I am trying to download my family tree (approx. 2500 people so not huge) from Ancestry.ca tree. I have followed the instruction and clicked on the ‘export tree’ button. The cursor is doing its thinking spinning thing and there is a message that says it may take a while. It has been 2 hours and it still reads 0% completed. Is this common? Should I try again? You would have to contact family tree DNA support for help. I forgot to mention that I am doing this to put it into GEDmatch. I can see a relative’s results on GedMatch but he cannot see mine. What am I doing wrong? Is it me or is this website confusing? Wait… we just figured it out! Thanks anyway! I have a number of *possible* ancestors and people included in my main Ancestry tree, but they are NOT connected to me or my family (yet). I hope to make the connections at some point, and I have them there as I know some are related thru DNA. But in creating a Gedcom to upload to GedMatch/Genesis, do you think that is going to be a problem? Maybe they won’t be included? Thanks! I usually recommend just creating a file with about 10 generations of ancestors for upload to GEDmatch. If you upload your whole gedcom, when a DNA match compares their gedcom to yours they will find in laws and other relatives that are not blood relatives.